On Monday, the doors opened to the I Promise School founded by LeBron James and his non-profit foundation. 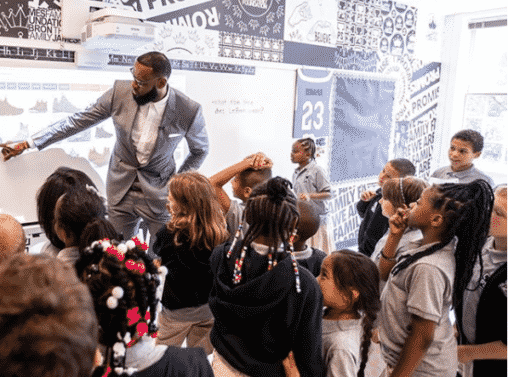 The NBA superstar launched the traditional public school to help at-risk third and fourth graders in his hometown of Akron, Ohio. The students who graduate are guaranteed tuition to the University of Akron, but the school is providing much more to support the community including GED and job placement services for parents and food pantries to the students’ families. James said opening the school was the “greatest moment” of his life. He decided to open the school because he can relate to being a fourth grader in Akron and missing 83 days of school. “I walked the same streets. I rode the same bikes on the streets that they ride on. I went through the same emotions. The good, the bad, the adversity. Everything these kids are going through, the drugs, the violence, the guns, everything they’re going through as kids, I know,” he said at opening day, according to the Los Angeles Times.